As NASAprepares its Mars Phoenix spacecraft for an August launch, program officialsare still trying to find a suitable landing site. Using datafrom two spacecraft – Mars Odyssey and the Mars Reconnaissance Orbiter --already orbiting the red planet, mission managers are searching for a landingzone near the northern polar region where there is a permanent ice cap. 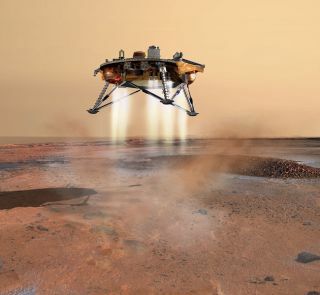 The $386million Phoenix lander mission will be the first tofly under the rubric of NASA’s “Scout” program. Once safely down on martianreal estate, the lander is to use a sturdy arm to dig for subsurface water ice.The lander is outfitted with a set of instruments designed to help scientistsglean clues to climate change on Mars, anjd search for potential habitats thatmight support life. NASA’s MarsOdyssey has been orbiting the red planet since October 2001. One of its primaryinstruments is the Thermal Emission Imaging System – called Themis for short.This camera operates in the visible and infrared parts of the spectrum and hasbeen busy determining the distribution of minerals on the surface of Mars. Aparticularly cool feature of Themis is that in the martian night it maps heatradiating from rocks on the planet’s surface. And when Themis focused in onRegion B – the top candidate for the Phoenix landing zone – it was an eye-opener. “Region Bwas just speckled with little hot spots that we now know are rock and boulderfields,” said Philip Christensen at Arizona State University in Tempe, aleading Mars researcher and Principal Investigator for Odyssey’s Themisinstrument. In thequest to find a safe haven for Phoenix, Odyssey has been one busy bird, Christensen said. “Half ofthe Themis bits coming from the spacecraft are devoted to the site survey for Phoenix. We are making a significant numberof thermal maps of the candidate landing site areas,” Christensen said. Christensenadded that the collaboration – an imaging campaign — between Themis’ thermaldata and the super-powerful Mars Reconnaissance Orbiter’s (MRO) High ResolutionScience Imaging Experiment (HiRISE) has been going extremely well. “We areusing Themis data very successfully to narrow down the choice of sites, as HiRISEfocuses on the areas where Themis data show the ground is largely rock-free,”Christensen noted. It was thezoom lens of MRO’s HiRISE that aced out Region B as the Phoenix landing locale. Numbers of bigrocks became a big issue with receipt of the first HiRISE shots late last year. “Everythingwas looking good until [they received the] HiRISE images. They just blew us away. Mars just did it to us again,” said Ray Arvidson, a Phoenix science team member from Washington University in St. Louis, Missouri. Why there’san abundance of rocks in that zone is a brainteaser, Arvidson noted. Perhapsthick deposits of windblown dust are underneath the rocks, causing them to riseup on top of this dust mantle. Or climate changes have expanded and contractedthe icy landscape, forcing large rocks topside, he suggested. The tasknow, Arvidson observed, is interpolating between the ground truth as revealedby HiRISE and the pre-dawn Themis data. And thenice news is that three prospective Phoenix landing areas have been pinpointed. Anxious toidentify a happy address on Mars for Phoenix is Peter Smith, Phoenix Principal Investigator at the University of Arizona's Lunar and Planetary Laboratory in Tucson. Smith saidthat Odyssey’s Themis nighttime infrared is delineating the locations of thehot rocks. Meanwhile, HiRISE images quantify local rock concentrations. Thisdoubling up of spacecraft has yielded a powerful combination of information toprovide both coverage and high resolution of the “latitude girdle” between 65 and72 north in which Phoenix is to land, Smith said. AlfredMcEwen, principal investigator for the HiRISE instrument and Director of the University of Arizona's Planetary Image Research Lab, said HiRISE images acquiredover the past few weeks — concentrated over the new candidate landing ellipses— have shown far fewer boulders than images of the previous candidates. “So it’slooking good,” McEwen concluded.